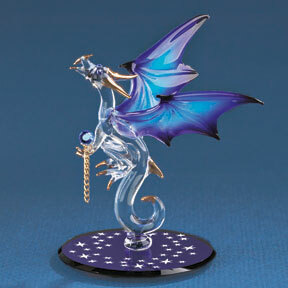 This gorgeous collectible features a dragon hovering over a starry scene. 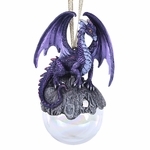 The dragon is crystalline clear with gold accents, and has wings of blue and purple, tipped in black. He holds a faceted blue crystal with a dangling golden chain. Beneath the beast is a mirror base with a design of stars upon it. 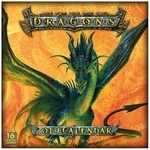 This figurine is sure to delight any dragon lover!